I’ll just come right out and say it: Lake Havasu is the best place in Arizona to see loons and grebes. Four-loon and six-grebe days are possibilities on Lake Havasu. Loon numbers well into double-digits are not unexpected, and grebe numbers sometimes break four digits. Such numbers and diversity make the LCRV, and Lake Havasu in particular, ideal for studying and ticking these charismatic diving birds in Arizona. 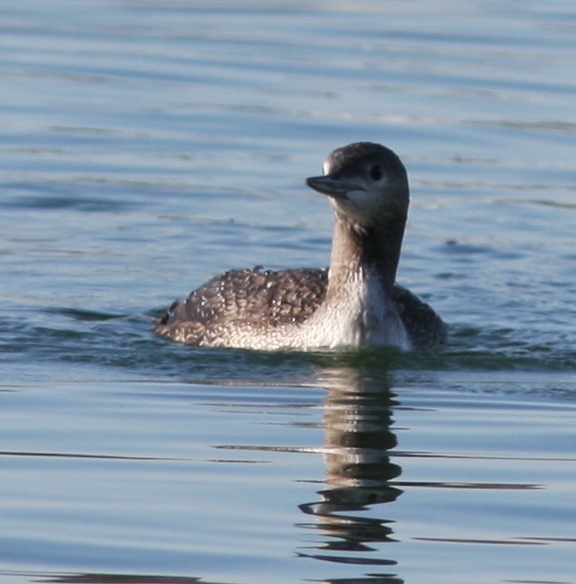 But they can be tough to find, and loon and grebe identification is full of pitfalls. Below I outline tips for finding, watching, and identifying loons. I will focus on basic (winter) plumage of those species that typically occur in winter, but bear in mind that any species can show some alternate plumage in spring. Also be sure to check out this post for more lake-scanning tips, this post for information on shad runs which are loon and grebe magnets, and this post on uncommon loon vocalizations. In my next post on this subject, I will cover tips for grebes. Loons are a frustrating group of birds. As I often say, they don’t actually need to breathe air. It’s not uncommon to spot an interesting loon in the scope and zoom in only to have the bird dive, and never resurface. Okay, it probably does resurface eventually, but they can stay down for minutes at a time and move long distances underwater. Usually, when waiting for a loon to resurface, it’s best to keep an eye on the spot where you last saw it. Loons will often stick to a favorite spot and resurface there again and again. If you don’t see it after a few minutes, then it probably moved off and it will just take luck to spot it again. Loons are versatile creatures, and will use a variety of (aquatic) microhabitats for foraging and loafing. While they are typically found on large reservoirs, they will forage anywhere from the middle of a lake to right against the shoreline. I have spent long periods of time scanning for distant loons, only to find one ten feet away when I stop scanning to rest my eyes! I once even saw a Red-throated Loon nearly chase a fish onto Rotary Beach. Foraging loons follow the fish, so keep an eye on gulls and other fish-eating birds to key in on areas where a loon may be fishing. Most people don’t think of loons as social creatures, but they will often gather in groups on the water. They do tend to associate with members of their own species, but it wouldn’t be unheard of for a Pacific Loon to join forces with a Common Loon, especially when it’s the only one of its species around. In that case, the trick is picking out the Pacific from the common Commons. Common Loon is by far the most numerous loon on inland lakes. As with any birds, it’s best to be familiar with the most likely species before setting out to look for rarities. Common Loon is large and bulky. The bill is thick, usually silvery-looking but with a dark culmen. The head looks blocky and angular, with a big lump just in front of the eye. The eye is often surrounded by white feathers. The line separating the dark blackish nape from the white throat is crooked, a feature that is visible at a long distance and is very helpful for telling a Common from a Pacific Loon. Common Loons tend to show white on the sides and flanks on the water line, especially when relaxed. Look for Common Loon from mid-August to mid-May, and especially during peak migration in November and April. Small numbers (counts of 1-2) frequently summer. 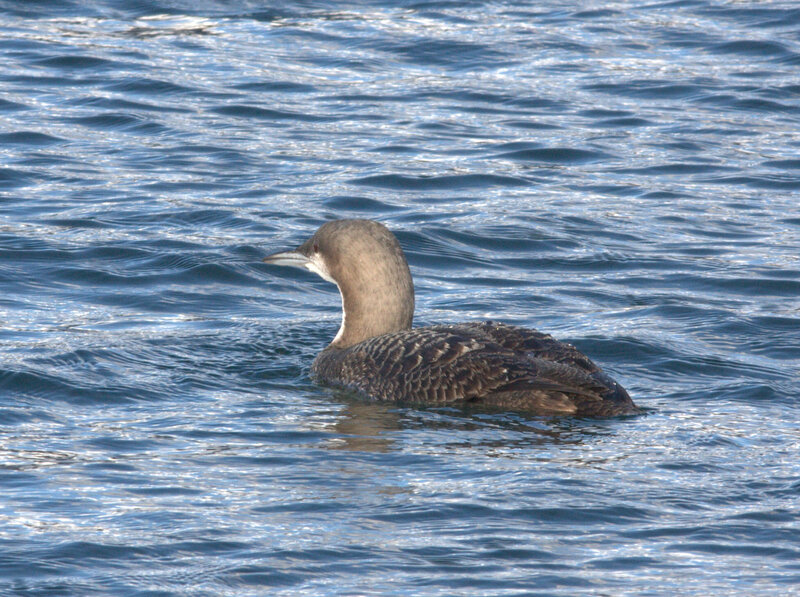 Pacific Loon is the second most likely species, after Common. They can occur in small groups and anywhere from one to ten are likely present on Lake Havasu in a given winter. 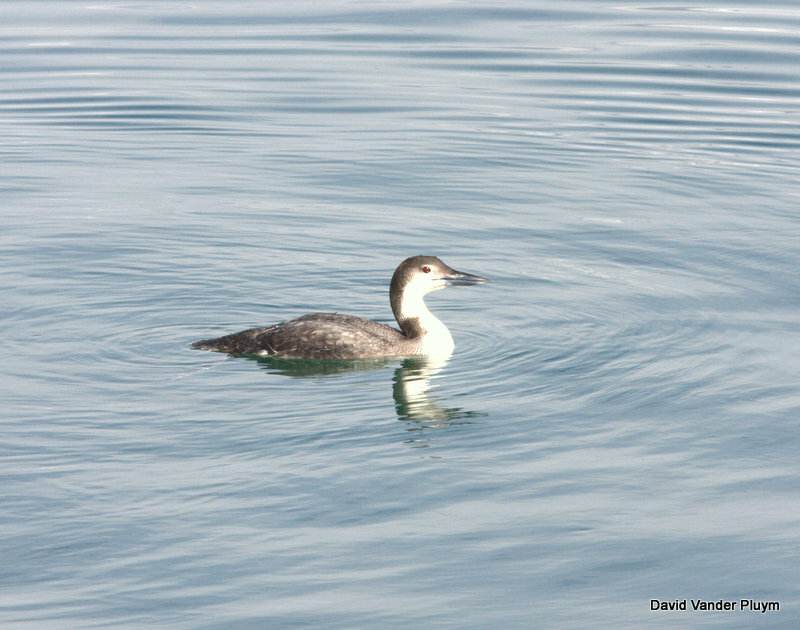 Unlike Common Loon, Pacific typically arrives in mid-November and is gone by the end of March. Pacifics are intermediate in body size, bill size, and overall bulk between Common and Red-throated Loons. The bill looks less angular and more evenly proportioned than on Common. The head and nape usually appear evenly rounded, forming a smooth curve from the forehead all the way through the nape, with no bump above the eye or peak at the back of the head. The division between darker nape and white throat is a smooth, sharply contrasting line, without indentations as in Common Loon. The nape often appears as a silvery color, especially in worn birds, unlike the blackish nape of Common Loon but similar in color to Red-throated Loon. The dark nape is very wide, so that a bird viewed from behind typically shows no white on the sides of the neck. The chinstrap is variable; its presence is a very good mark for Pacific Loon, but some individuals lack it, and it can be difficult to see at a distance. The eye is usually surrounded by dark feathers, never surrounded by white. Pacifics tend to show no white on the sides and flanks at the water line, but a very relaxed bird may show a bit of white, and it’s not uncommon for a bird to roll slightly onto one side, showing more of the white belly on one side than the other. Pacific Loon. Note head and bill structure; silvery cast to nape; sharp, straight line of contrast between nape and clean white throat; suggestion of a chinstrap. 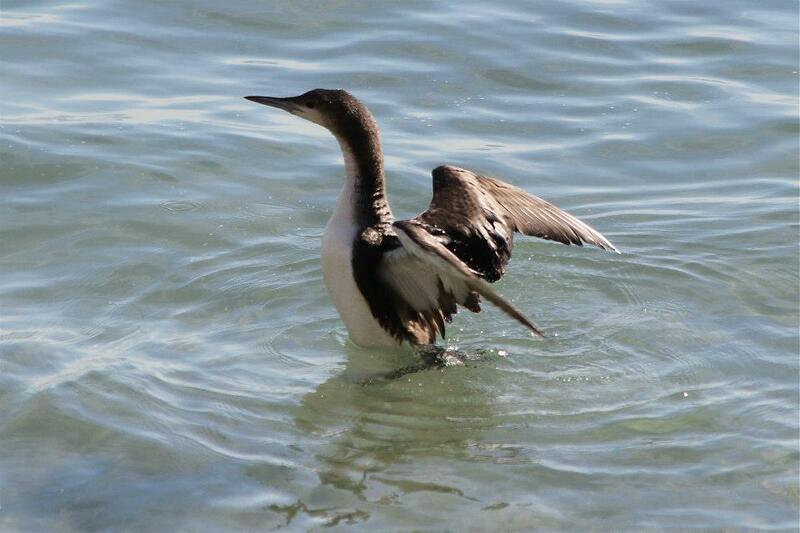 The same Pacific Loon from behind. Note the broad, silvery nape color. Common Loon photographed in 2008 which I found misidentified and mislabeled as a Pacific Loon. Note the large bill, blocky head, white around the eye, and jagged neck markings. 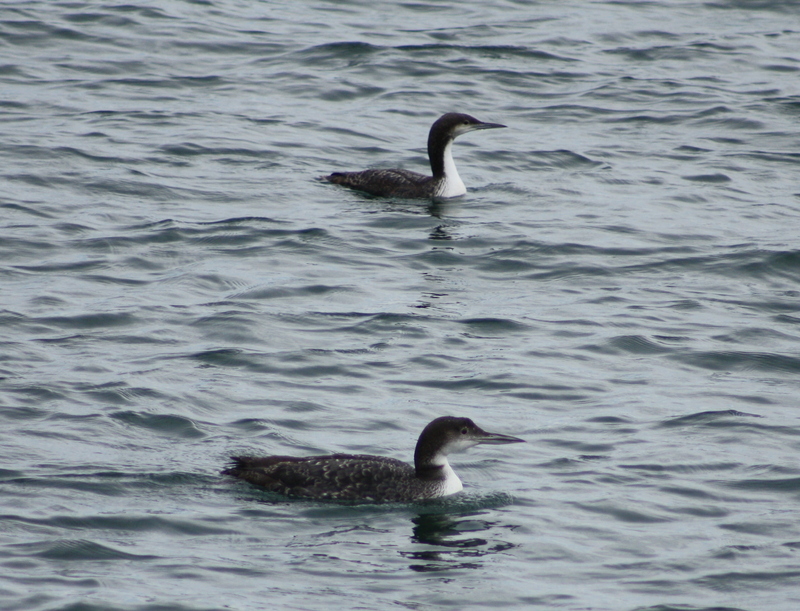 Pacific (above) and Common (below) Loons. Note especially differences in head and bill shape and bulk, and neck pattern. Photo by Mike Petriello. 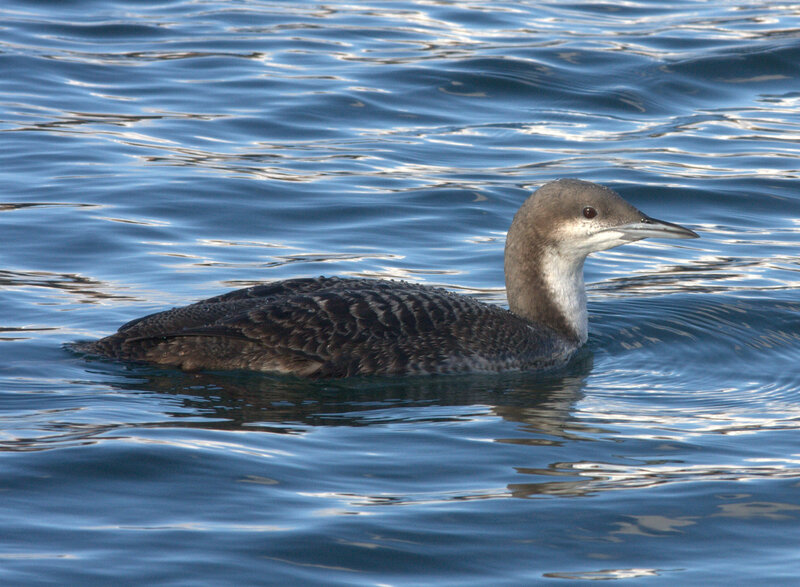 Red-throated Loon is less common than Pacific Loon, but probably does occur in small numbers every year, occurring from November through March. Red-throated is the smallest, most elegant, daintiest loon. They are often more similar to an Aechmophorus grebe than to other loons, being more or less the same size and similar in shape. The bill is silvery (though that varies depending on distance and lighting) and slender. It often appears to be tilted upward slightly, but not always. A relaxed bird is more likely to look this way. The head shape is distinctive: neither bulky as a Common nor smoothly rounded as a Pacific, but flat-topped with a distinctive peak at the rear. 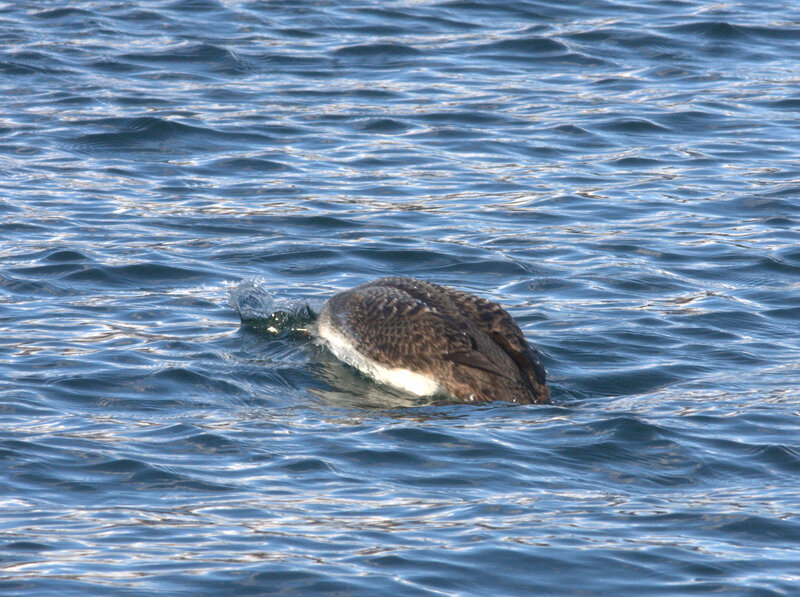 The sides and flanks nearly always show white on the water line, even on active birds. Unlike other loon species, juvenile and adult Red-throated Loons look dramatically different (although some juveniles can approach adults). Juveniles are far more likely to occur in Arizona. On juvs, the line between silvery (always silvery, never blackish) nape and paler throat is not sharply contrasting. The silvery nape is usually narrow, so that it often appears as a thin strip from behind with paler feathers on either side, like an Aechmophorus grebe. The throat can vary in juveniles from pure white (rare) to entirely dusky-silver (uncommon), but the chin just below the bill is always white. The most common pattern is a whitish throat with a variable dusky-silver patch, sometimes tinged reddish, on the center of the upper throat. On adults, the line between narrow silver nape and crown and pure white throat is very sharply contrasting, and the eye is completely surrounded by white. Yellow-billed is much rarer than the above species, certainly not occurring every year. I have much less experience with this species, having only seen two, and only one of these well. As such I have fewer tips about identification, and can only comment on ID of juveniles. 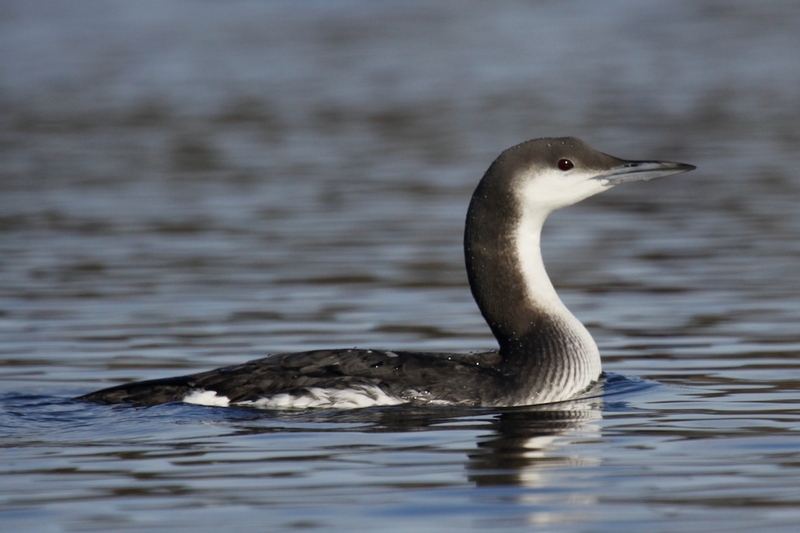 Yellow-billed is the largest and bulkiest loon, so the confusion species is Common. The first thing that most birders key in on is the bill. On Yellow-billed, the culmen is straight and dark on the basal half. The bill is large and bulky, and straw yellow. Sometimes Common Loons can have large bills, and the silvery color can even look yellowish in certain lights. Even more troublesome is the possibility of Common Loons with deformed bills causing confusion. As in most IDs, it’s best to look at multiple features, not just the bill. Yellow-billed Loons have paler heads, with more white on the face and an overall brownish, not blackish, color. Juveniles show a distinct brown spot on the auriculars. To see more photos of this individual to get an idea of how light and posture affect its appearance, click here. It has not yet been found, but it is a possibility. It has occurred in southern California and Baja California, and even Colorado has it on the list. Having only seen one individual, I can’t say much about identification. However, when I saw the individual in inland Los Angeles, I was surprised to see that it was more similar to a Common Loon than to a Pacific Loon! A word of caution: while Pacific Loons have less white on the flanks than Arctic, a relaxed, tilted or preening Pacific can appear to show the white flank patch characteristic of Arctic. Common Loon usually shows white on the flanks. 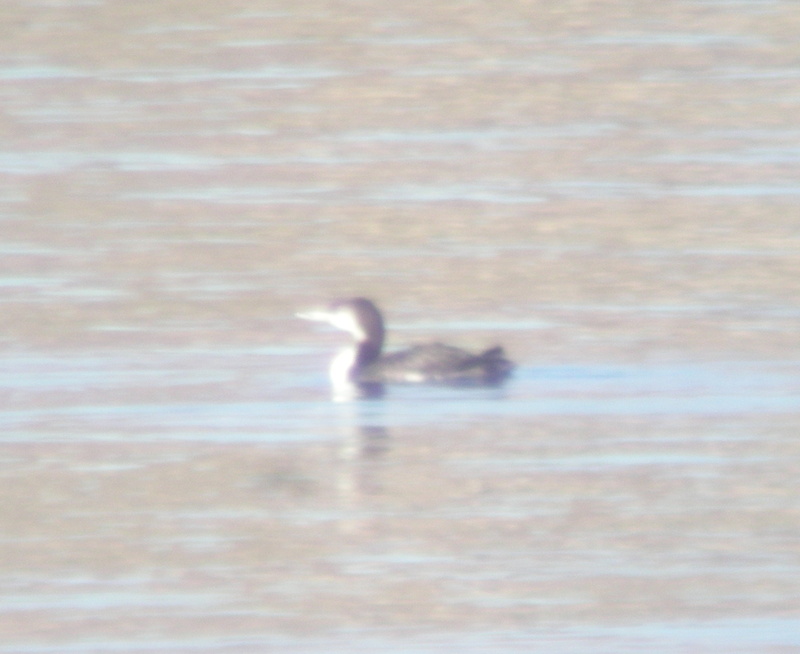 A potential Arctic Loon in the LCRV should be thoroughly documented with as many clear photos as possible. Diving PACIFIC LOON. This bird showed little to no white on the flanks when resting, but note how much white shows as it dives underwater! Arctic Loon. 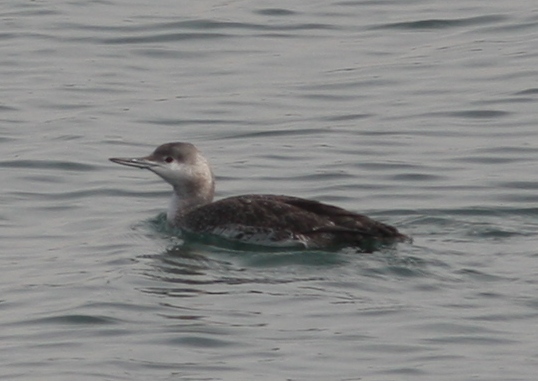 Note extensive white on the flanks, blocky head shape, Pacific Loon-like neck pattern. Photo by Michelle Tobin. Arctic Loon. Again, note extensive white in the flanks although this bird is riding very low in the water. 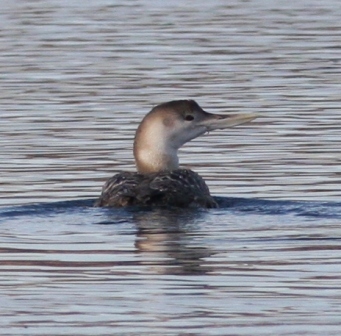 Blocky head shape with lump above the eye is unlike Pacific Loon; neck pattern is unlike Common Loon. Photo by Noah Gaines. Hopefully this information will be helpful in your quest for loons in the LCRV (and beyond!). Next up: grebes! This entry was posted in Identification, LCRV, Species Profiles and tagged Arctic Loon, Common Loon, Divers, Great Northern Loon, Lake Havasu, Loon identification, Loons, Pacific Loon, Red-throated Loon, Yellow-billed Loon. Bookmark the permalink. Excellent information!!! Hope I can remember some of it when I visit LCRV sometime in the future! Thank you for sharing!